Patients who have just recovered from Lap Band surgeries are often excited about their potential weight loss. Their life can change significantly as they transition from liquids back to solid food, and learn how their body responds to ingesting different things. It’s important to consult a doctor about changes and discomfort, although some degree of discomfort is to be expected. However, while the Lap Band is generally an effective tool for weight loss, it can become clear over time that the lap band isn’t functioning properly due to something called Lap Band erosion. It’s necessary to understand the dysfunction, and the extent to which it needs to be changed whether it should be adjusted fixed, removed or replaced, often with sleeve gastrectomy, aka the gastric sleeve. When the Lap Band is ineffective or causes nausea or improper digestion, treating the matter can be as simple as adjusting the lap band, which can be accomplished with relative ease. If Lap Band erosion is the culprit, however, the doctor will probably need to remove the band. Reflux and indigestion are signs that lap band erosion is occurring. The inability to eat anything can be a symptom. Generally this comes with some nausea. Conversely, being able to eat more and more, and in most cases gain more weight, are also symptoms of Lap Band erosion in some cases, depending on what sort of erosion it is. Erosion can be very painful, and requires some kind of intervention. What to do after Lap Band Erosion. In the event that removal is necessary, many of Dr. Feiz’s patients choose the Gastric Sleeve as a way of furthering their weight loss progress. 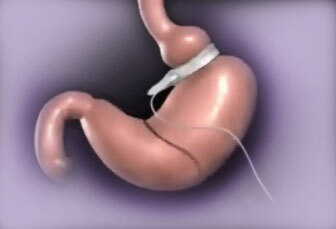 While the Lap Band procedure was extremely popular for patients electing weight loss surgery in the early 2000s, recently, the gastric sleeve has become the most sought after procedure because it is both proven to help patients lose weight more quickly than the lap band, while at the same time not needing regular adjustments. While it is not reversible like the Lap Band is, it can be a great solution for certain patients who do not want to have deal with some of the downsides of having the band, but still need to lose a significant amount of excess weight in order to improve their health. Dr. Feiz & Associates perform a wide range of weight loss procedures, and Gastric Sleeve conversion from Lap Band is an option Dr. Feiz’s team of surgeons would consider as on option.